Some reviews are easy to put together, but others have little stumbling blocks. The Monitor Audio SIlver 300 is one such product. They languished in the office storage for a week longer than they should have done and by the time I got them home, and in situ, I realised there was a 70 hour run in and about 96 hours before we went to press on this issue. This is known as ‘just in time publishing’! The Silver 300 is part of Monitor Audio’s new Silver 6G series. 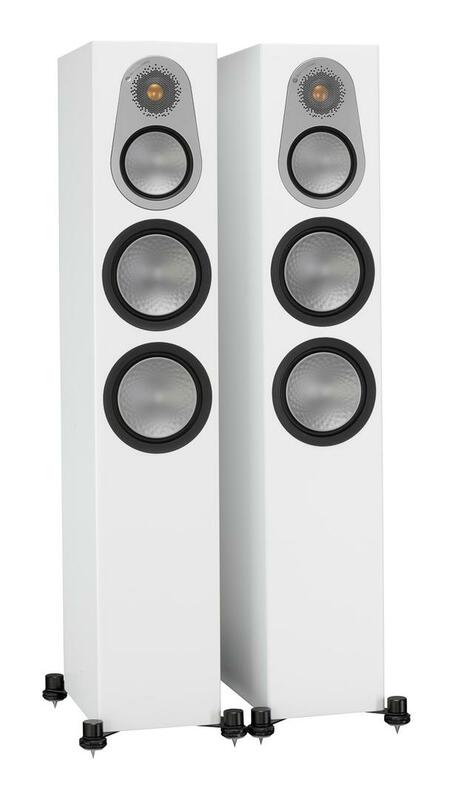 As the name suggests, this is the sixth generation of Silver models and the Silvers have been a staple of Monitor Audio’s product line-up for more years than I care to remember (I recall reviewing a pair of floorstanders back in the days when Mo Iqbal used to run the company, and that was back when years began with ‘1’). The Silver series has always combined good looks, sophisticated technology, a sound that is both good and popular, and very keen pricing. The range of finishes is always good, too; maybe not to the same extent as seen in the exotic woods seen in the Gold and Platinum II ranges, but real wood veneers and high gloss lacquers as opposed to the vinyl wraps of the entry-level Bronze range. I don’t want to go too ‘business’ about this, but Monitor Audio’s keen sense of market segmentation and its ability to reach more customers as a result has been part of what makes it one of the most successful British loudspeaker brands of today. As such, there’s a heck of a lot riding on the new Silver line, a range which includes a larger 500 and smaller 200 floorstander, Silver 50 and 100 standmounts, as well as a wall-mounted ‘FX’ model, two centre channels, and a pair of active subwoofers for home cinema systems. What Monitor Audio does in all its ranges is punch above its weight in terms of the complete package. The level of fit and finish, from the outrigger feet to the magnetic grille, right through to the protection over the gold dome tweeter, all suggests a loudspeaker of quality and distinction. For £1,250 per pair. In the high-end, I couldn’t get arrested for £1,250 (not simply figuratively, as there’s nothing I could get caught stealing in the high-end world that only costs £1,250, except maybe a loudspeaker spike). Asking those who managed to swing by my place in the all-too-brief time I’ve spent with the Silver 300s, they all put them (on looks alone) up in the £4,000-£5,000 mark. The review pair came in a sophisticated gloss black, but gloss white, black and natural oak, and walnut veneers are also available. With so many lines (Radius, Pro, Bronze, Silver, Gold, Platinum II, and small sub/sat systems) development is often a case of an innovation in one series trickling up or down across all the ranges as and when they ‘refresh’. This is a very effective system of continual development, used by everyone from Apple to Zildjian and is fairly common among larger companies in the audio business. This makes finding the origin of the technologies somewhat complex, as the port might come from the Gold series, the bass driver might be derived from Bronze, and the tweeter might have been seen first in Platinum II, but was developed for a project that never saw the light of day. Factor in the maturity of the brand, and it’s often best to look at the latest iteration tabula rasa.